Host Grace Matthews sums up the Trump visit to Springfield and paid protestors with Connor Murphy. The two hosts talk about the tragic Texas floods and discuss flood insurance or the lack of an ability to qualify for flood insurance and compares Hurricane Katrina with Texas floods of 2017. Connor and Grace also bring up the recent missile fired over Japan and the show of force. Connor also asks a viewer question. "If aliens came to Earth and asked to speak to our leader, do we introduce the aliens to Trump? Yes/no and why. Leave us a comment what you think. 01:45 Updates on Springfield Trump Visit 02:00 Truth About Paid Protestors 05:25 Texas Flood Disaster 07:30 Hurricane Katrina vs Texas Flood of 2017 17:15 Flood Insurance and Lack of Qualification for Flood Insurance 24:00 North Korea Fires Missile Over Japan, U.S., Japan, and South Korea Show of Force 28:00 Alien FRB signals? 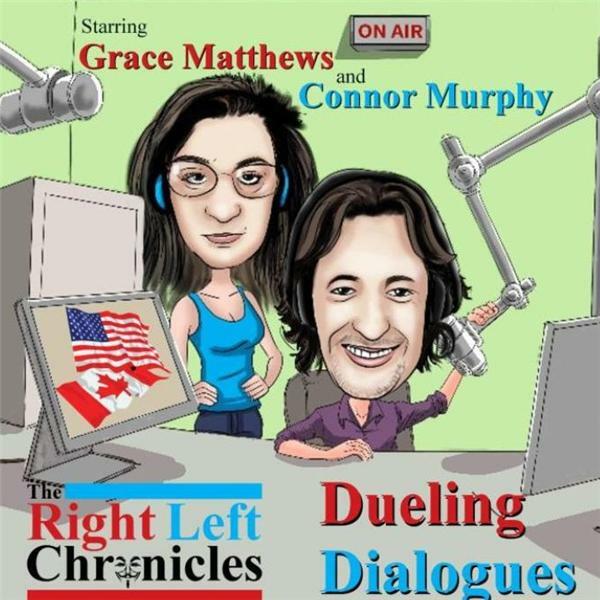 For a list of source links, visit http://therightleftchronicles.com/podcasts/623/dueling-dialogues-podcast-ep-9/ A Dueling Dialogue based on the politically charged emails exchanged between Canadian leftist, Connor Murphy, and United States Midwestern conservative, Grace Matthews. Both are writers at The Right Left Chronicles. Away from the bubble and the beltway, alone, together or with a guest, Murphy and Matthews squabble over current issues and events that impact everyday citizens in the United States, Canada and elsewhere in the World. It’s unobstructed free speech about politics, media, economy, people, social media, and legislation. Eager listeners with a fascination for presidential politics won’t be disappointed as President Donald J. Trump and Prime Minister Justin Trudeau are usually front and center, and rarely far from the topic of the day.